Dive deep into the ocean inside the New England Aquarium in Boston and experience engaging exhibits featuring animals from across the globe. Catch a glimpse of sharks and rays in the largest shark and ray tank on the East Coast, and stand in awe of the four-story, 200,000-gallon Giant Ocean Tank, home to everything from sea turtles to sharks to tropical fish. 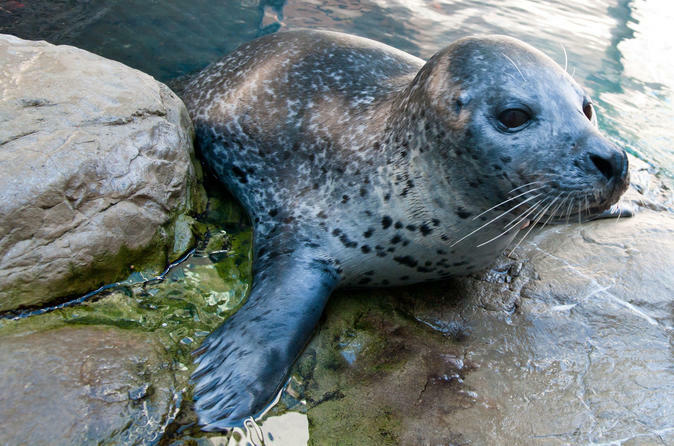 See seals and enjoy interactive exhibits at the New Balance Foundation Marine Mammal Center. Meet Northern fur seal pups and two frisky California sea lions at the open-air exhibit space featuring sweeping views of Boston Harbor. Visit the exhibit area with blue penguins from Australia -- the smallest species of penguin in the world -- and learn how they got their name as you watch them take a dip in the water, preen, socialize, and eat. Explore the aquarium’s backyard with the Gulf of Maine exhibits, featuring such local mainstays as Atlantic cod and halibut, rare blue lobsters, and the notoriously ugly monkfish (also known as goosefish). Try to spot the camouflaged seadragons at the Thinking Gallery and don't miss the Freshwater Gallery, where you can explore wildlife from the flooded forests of the Amazon River Basin to the still waters of a New England pond. You can also sit back and experience an unforgettable IMAX® film! The Simons IMAX Theater uses amazing IMAX 3D technology and New England's largest screen to take you to places most have only dreamed of going. IMAX films provide people of all ages with larger-than-life experiences that captivate, enlighten, and inspire (see list of movies in Itinerary section).